Summary: Australian filmmaker Gracie Otto profiles perhaps the most famous person you’ve never heard of: Michael White. This larger-than-life theatre and film impresario single-handedly transformed the cultural scene of 1970’s London. Amongst the glitter and endless parties, White brought risqué productions such as The Rocky Horror Show to the stage, Monty Python’s The Holy Grail to the screen and introduced dance legends Merce Cunningham and Pina Bausch to the British masses.This is a fast and entertaining documentary with a stellar cast of famous friends and ex-lovers to boot including John Cleese, Yoko Ono, Naomi Watts, John Waters, Barry Humphries, Anna Wintour and Kate Moss. Michael White… ever heard of the name? If you are honest then the answer would be no, unless you have memorised a website like IMDB off by heart. It’s the premise that Michael White is the most famous person you’ve never heard of that actress turned filmmaker Gracie Otto uses to promote her first feature documentary The Last Impresario. For those not in the know Michael White is a man who can walk into the Cannes Film Festival and instantly have members of the elite film groups fawn all over him. There is little chance that any serious film, theatre or television fan hasn’t seen at least one thing that he has produced at one stage in his life. From working with the likes of Yoko Ono on small alternative theatre pieces to producing the show that would eventually turn into the mammoth that we know as The Rocky Horror Picture Show it seems like Michael White has been there and worked with everyone. His work on some small theatre pieces and then television shows and films such as Monty Python also has many labelling him as one of the forefathers of modern comedy. The White that Otto catches on film though is not the Michael White that once partied all night with the likes of Mick Jagger and Kate Moss. No the White we get to meet is a mild-mannered old man who series of strokes has left him with a speech impediment and has been lowered financially to the point of having to auction off some of his prized possessions including letters from the likes of John Cleese and Laurence Olivier. He is even coy about whether or not he still owns the rights to some of his best productions including The Rocky Horror Picture Show. As a filmmaker Otto does a good job with The Last Impresario. Certainly any film or theatre fan is going to sit captivated as she tells the story of a man you almost feel guilty about not knowing. And while interviews with the likes of Barry Humphries, Kate Moss and John Cleese do give you a wonderful view inside both the business and personal life of Michael White you do start to get the feeling that Otto has perhaps relied too much on talking head interviews… especially when you consider just how flamboyant White was with his life. Another really annoying trait of this documentary, and I know this is being really picky, is the way in which Otto asks the questions to White during his interviews. Because she hasn’t got a microphone near her for most of the time she simply yells the questions out. Yes it sounds like a small thing to have a gripe about, but it does become increasingly annoying and is certainly something that the top documentary film makers of our time would never, ever do. 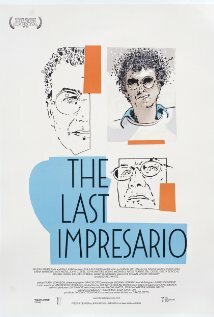 Still The Last Impresario is a good documentary that will be loved by those who enjoy to learn a lot more about the cinema and theatre they have grown up. Cudos must be paid to Gracie Otto for being able to put together such an A-List of interviewees as well as being the first person brave enough to bring the Michael White story to the big screen. This is one for all the cinephiles out there.